What Tire pressure is best for my car? The right tire pressure is vital to safe and comfortable driving. A tire can only perform at its best when it can ensure adequate stability and load capacity. That requires a correct tire pressure. A too low tire pressure directly causes reduced stability, increased wear and higher fuel consumption. If the tire pressure is far too low, the tire can even overheat and be damaged beyond repair. Such damage is not in all cases directly visible. Life-threatening traffic situations may be the result. The tire pressure should preferably be checked every fortnight and at least once a month. Do not forget the pressure of the spare tire. You should also check the tire pressure before embarking upon a long journey. You should preferably check the tire pressure only when the tires are cold. Cold tires means that for at least 2 hours the car has not been driven or only very little and calmly. If you have already covered a few miles, please note that the tire needs a least 0.3 bar more than the recommended pressure. Never reduce the tire pressure when the tires are hot. In many cases this results in a tire pressure below the recommended pressure. At all times the tire pressure must be the same per axle. Of course the valve must be fitted with a valve cap. Studies have shown that many people observe a too low tire pressure. Therefore we recommend to visit the website www.houddespanningerin.nl to check the correct tire pressure for your car. Does a nitrogen-filled tire keep its pressure for longer? A tire filled with 100% nitrogen loses its pressure more slowly than a tire filled with regular air. However, the difference is not very significant because atmospheric air already contains four times more nitrogen than oxygen. Nitrogen makes for a dry filling (no water vapour), which is positive with a view to corrosion as well as to temperature control. The pressure increase due to temperature fluctuations is the same for both filling materials. That means tires filled with nitrogen in cold condition don't need a different pressure than tires filled with air. Basically, the use of nitrogen is not required for Vredestein passenger car tires. The quality and corrosion resistance of modern car tires and rims is fully adequate for regular air filling. Note: remember that tires with nitrogen filling must still be checked regularly for their correct pressure (see item 1). All kinds of conditions such as tire damage or not fully sealed valves may cause rapid loss of pressure from a nitrogen-filled tire just as well. Low-section tires are characterised by their relatively low sidewall height. If the tire pressure is too low, there is a considerable risk the low sidewall will touch the road surface. That may even wreck the tire and the rim. When the tire is pressurised correctly, only the tread touches the road surface. 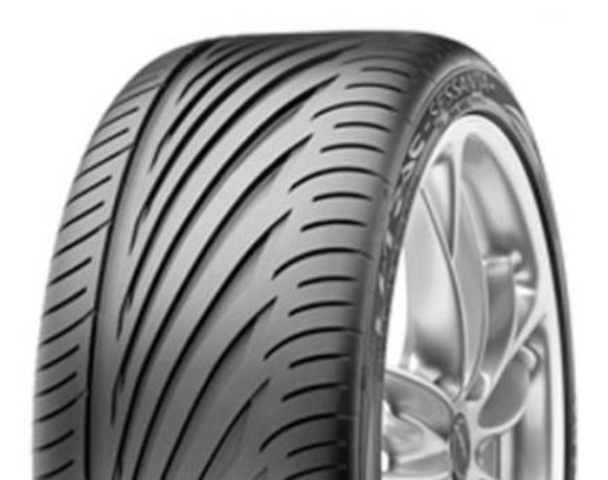 For low-section tires you should choose the value indicated for full load and high speed. Also take into account that the load capacity of low-section tires may be lower than that of standard tires. Then the tire pressure must be increased. For high-speed tires (V, W, Y and ZR) and for light alloy rims, the use of alloy valves is recommended. The flexible shaft of rubber valves may bend and/or tear, which may cause loss of air. Does my tire's tread depth influence the handling characteristics? Tires will always remain the all-important factor for the contact between and road surface. Tread depth has a major influence on optimum tire performance. 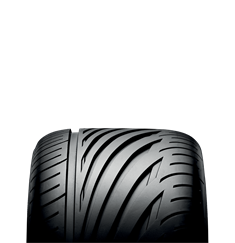 Dependent on the type, new tires have a tread depth between 7 mm and 9.5 mm. This tread ensures optimum properties under varying weather conditions. In Europe, the mandatory minimum tread depth for all passenger car tires is 1.6 mm. However, from a safety point of view, tires should be replaced no later than at 2 mm. Winter tires already reach their wear limit as regards cold weather properties at a remaining tread of 4 mm. Basically, winter tires with a remaining tread of less than 4 mm can no longer be considered winter tires. The tire tread contains wear indicators TWI (Tread Wear Indicator) that show when the wear limit is approaching. See the red circles in figure 1. The risk of skidding increases on a wet road. The risk of aquaplaning also increases as the minimum tire tread depth is approaching. However, it is not possible to determine for every tire type what the minimum tread depth is below which the tire becomes risky to drive on. A general rule is that the wider tires are, the higher the risk of aquaplaning for worn tires. To get the most out of your tires it is recommended to change them from front to rear and back every 10,000 kilometres. It is not recommended to exchange the tires crosswise. Don't forget to adjust the tire pressure to the new position of the tires. These measures will extend the tire's service life and give you a smoother ride. What's the difference between summer and winter tires? The major difference between summer and winter tires is the tread. A winter tire (figure 2) has various notches in the tread blocks that we refer to as lamellas. When in contact with the road surface these transform into a kind of “saw teeth”, increasing the grip on snow and ice. That considerably reduces the braking distance on snow and ice. In addition, road adherence and cornering characteristics on snow and ice are much better. A summer tire tread (figure 3) does not have lamellas and is characterised by wide longitudinal grooves and compact shoulder blocks. These longitudinal grooves ensure that water is carried off quickly while the shoulder blocks ensure proper cornering characteristics. The rubber mixtures also differ for summer tires and winter tires. The rubber composition of summer tires performs best at temperatures higher than 7 degrees Celsius. 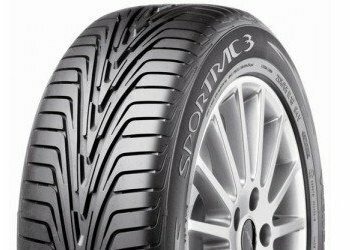 At lower temperatures the flexibility and elasticity of the rubber decreases, reducing the tire performance. The rubber mixtures of winter tires contain special raw materials that keep the tires flexible and elastic at low temperatures. So not only on snow and ice, as people generally think, but also at temperatures below 7 degrees Celsius winter tires outperform summer tires. Tires with a code “M+S”, “M&S” or “MS” on the sidewall are specially designed for optimum performance on Mud + Snow. This code is required under the law for a tire to qualify as winter tire. It is permitted to use winter tires with a lower speed code than the maximum vehicle speed. When using winter tires with a lower speed code than the maximum vehicle speed, some countries prescribe that a sticker must be placed on the dashboard to remind the driver of the maximum speed for the tires in question. However, the tire manufacturer is no longer accountable at speeds higher than indicated by the code. The regulations regarding winter tires may differ per country. If the tires are still on the wheels, then store them lying down with the tire pressure reduced to 1.0 bar. If the tires have been taken off the wheels, put them in upright position or lay them flat on top of each other (stack no more than four). It is recommended to clean them with water to remove any salt residues. Then allow them to dry thoroughly. Preferably, the tires should be stored in a cool, ventilated place without direct daylight. They should not be stored near ozone-emitting electronic equipment such as welding machines, transformers, electric motors. Moreover, they should carefully be protected from chemicals, solvents, lubricants and oil products. Spare tires deserve additional attention; they may be old or aged. In addition, they must have the correct pressure. Remember that when you are driving with different rims (e.g. alloy rims) their bolts/nuts are probably not suitable for the spare tire. So do not forget to take along the spare wheel bolts/nuts. Use of the spare tire in an emergency may mean switching to a different type of tire. Do not forget to adapt your driving behaviour to the changed situation. Some tires have a directional tread. A directional tread ensures optimum water dispersion and sound reduction. For that reason it is important that the tires are fitted correctly. 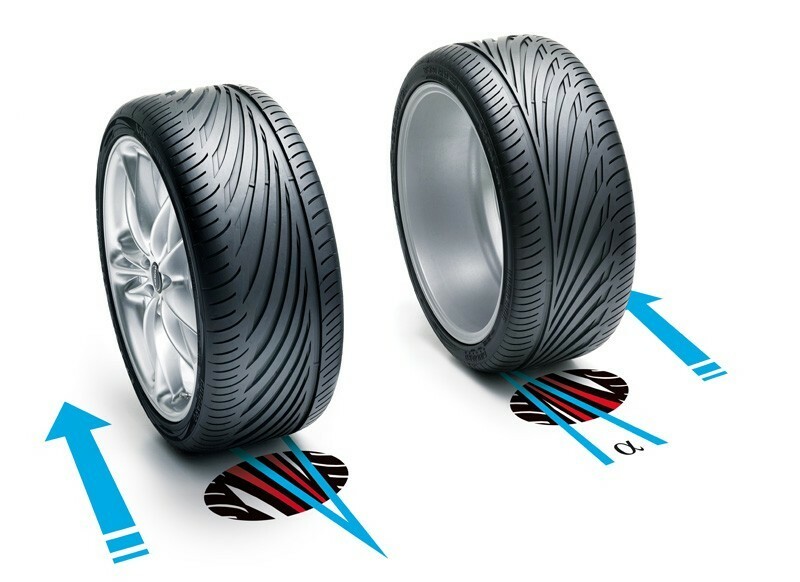 Directional tires must be fitted with the point of the arrow with the text ‘ROTATION’ pointing towards the forward driving direction of the vehicle. This arrow is placed on both sidewalls of directional tires. Tires with an asymmetrical tread also exist. One example is the Vredestein Ultrac Sessanta. The inner tire section has a “more open” tread than the outer section. 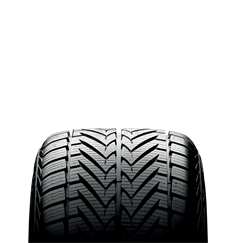 The outer tire section with the “less open” tread is intended for high traction on a dry road and road adherence in corners while the inner section has a “more open” tread. That results in an improved dispersion of water. The “most open” tread must always be fitted on the inside as indicated in figure 4. The text “INNER SIDE” on these tires helps to prevent that the tires are fitted incorrectly. This means when the tire has been fitted under the vehicle, the sidewall with the text “INNER SIDE” is not visible. In some countries it is prescribed when snow chains must be used. Always ensure that you are certain your snow chains fit. That is important because then the chains cannot damage vital parts of the vehicle. Not every chain fits every car. So try to fit in the snow chains at home at least once so you will not be facing unexpected situations. Chains must always be placed on the driven wheels. Do mind your speed when you are using the chains. The tire sock is often called the ‘alternative’ for the snow chain. It is a kind of sock that is pulled over the tire. The netting on this sock is said to have the same effect as a snow chain. In particular for people with little room for snow chains in the wheel housing it is supposed to be a godsend. However, this product is certainly not advisable as an alternative to the traditional snow chain. What do the codes on the tire sidewall mean? 215: tire width in mm. TWI wear indicator (Tread Wear Indicator) minimum tread depth 1.6 mm. ROTATION indicates the forward driving direction that must be observed when fitting a directional tire. The size indication for tires vans and light lorries (C tires) is shown according to ECE* Regulation 54 and only deviates little from ECE_R30 for passenger card tires. * ECE = Economic Commission for Europe (UNO Institute in Geneva). Reinforced tires are the best choice for caravans because caravans often carry a considerable load. These tires have a modified design. You can choose between van tires (commercial tires) or Reinforced (RF) / Extra Load (XL) passenger car tires. In many cases collapsible caravans and small trailers are equipped with “high speed trailer tires”. For these tires the pressure level strongly depends on the tire size and the carcass strength (indicated with ply rating number or load index).